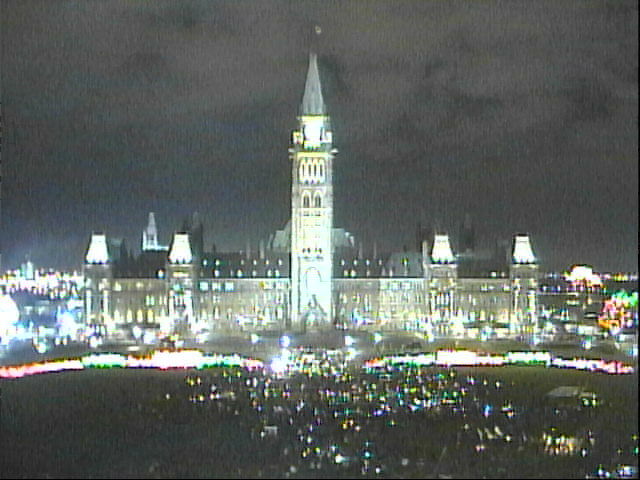 The following image is from the Live webcam overlooking parliament hill at about 5:45pm today. Thousands of Canadians have descended upon the hill at Parliament to protest a man. They have come to protest a man who rose to distinction after a questionable contest which saw weeks and weeks of counts, recounts, after ballot box stuffing and potential voter fraud. The implications of this man on Canada and the world ranks among the concerns of the people gathered in Ottawa today. Some have called his advocates arrogant, advocates which idolize him and call him fondly by his silly nickname think that his ideas and policies are what’s best for the U.S., Canada and the world, and to disagree would with him might well label you anti-patriotic by his frothing ideologues. This man’s colleagues would have especially deleterous effects on the Canadian economy if we ever allowed them greater influence; trade would slow to a trickle. To top it all off, his closest advocate is a balding man who actually runs the show and has a knack for media manipulation. I sure didn’t vote for him. Tonight, I’m gearing up for one of those long nights in the lab of growin’ it, resolvin’ it and probin’ it. I am, of course, talking about my protein of study which may well help in the treatment of Rheumatoid Arthritis, inflammation and asthma and whose study may initiate the development of a drug to replace Vioxx and Celebrex. So, that’s my life right now, outside of harping for Harper, masticating the Martinites and laughing at Layton: I’m growing protein and lovin’ it. Hopefully, I’ll get some sleep tonight before my lab meeting presentation tomorrow. I thought I’d try my hand at a science related post and share, with you, its lighter side. Ever since Google Scholar was released in beta earlier this month, I’ve been poking around and testing it out to see what I could find. The website searches through peer-reviewed scientific journals and other literature and reveals the body of knowledge concerning any topic of scientific interest. Between work-related searches, I’ve tried out a few interesting queries and submit them here for your review and amusement. Requirements that a vision system must meet to make Superman’s x-ray vision possible are stated, and two solutions are proposed. In one, emitted x-rays carry the information to Superman’s eyes; in the other, emitted rays make objects transparent to a second type of ray. Further subjects lending themselves to this type of research are superhearing , the biomechanics of leaping tall buildings, or being faster than a bullet. I imagine that the idea for this article was conceived while studying the effects of alcohol or THC. Hey maaaaan, I wonder how Superman’s X-ray vision works. It would be killer to have superpowers, maaaaaan. That would be awesome. The present research uses priming techniques to modify commitment to and engagement in future helping behavior. Relative to a control condition, people primed with the exemplar Superman saw themselves as less likely (Studies 1a and 1b), and participants primed with the category superhero saw themselves as more likely (Study 1a), to help in hypothetical situations. Study 2 extended these effects to real-world planned helping behavior, by demonstrating that these primes impacted commitment to future volunteerism. Finally, Study 3 showed that these changes in initial commitment impacted volunteering behavior up to three months after initial exposure. These results demonstrate that fleeting situational primes can impact not only spontaneous behavior, but also future behavior. So, if people are prompted with the thought of Superman, they are less likely to help others in the future. But, if people are prompted with the thought of superheroes in general, they are more likely to help. David Pescovitz from Boing Boing notes that psychologists propose “that the average person quickly realizes that there’s no way they can compare to the Man of Steel”. Silly. Superman is also a the name of a gene found in the flowering plant known as Arabidopsis thaliana. Other genes and proteins have been named after other fictional characters and popular culture. Sonic the hedgehog, Hamlet and of course the INDY gene/protein (after the famous line from Monty Python’s Holy Grail: I’m not dead yet!) are just a few examples. Science can be amusing, rewarding or downright embarrassing. How would you like to work in the laboratory which submitted “Flatulence–causes, relation to diet and remedies” for publication? I may have typed flatulence into Google Scholar on some kind of juvenile whim, yet there are those that dedicate their careers to it. I would guess that these researchers are either a hit or a big miss at parties, depending on the type of gathering of course. After a late night party you may have returned home and watched some late-night TV (infomercials) before crashing for the night. You may have seen that infomercial for those ‘magical’ ionic bracelets that relieve muscle and joint pain. Turns out that the therapeutic powers of the bracelets may be attributed to the placebo affect. Nimal and Schwartz detail their findings in a research article named “Are ionized wrist bracelets better than placebo for musculoskeletal pain?”. Turns out that the answer is no. The researchers also state “while the bracelet did not work better than placebo, many patients may experience less pain if they purchase and use it.” Ah, the power of positive thinking. Google, of course, is based upon an algorithm and isn’t heavily filtered or edited by actual people. Google News presents the news of the day entirely without an editor by presenting news stories as top stories through a Pagerank system (Yes, there are scientific papers published about the pagerank algorithm). Google Scholar contains a very amusing citation that Jens Thilo Teubner includes in his paper on “Optimization of High Efficiency Thermoelectrics based on Tl5Te3“. This paper outlines the efforts made by Teubner to optimize the thermoelectric properties of thallium/tellurium compounds. On the 18th page of this research article, the Fermi-Dirac distribution function is provided to describe the “the charge carrier distribution in a material” in the “unperturbed equilibrium state with no electric field or temperature gradient”. The author cites none other than Britney Spears’ Guide to Semiconductor Physics (an internet classic) as an example and therefore Google contains the citation from B Spears. We now conclude our tour of Google’s new search program that is sure to excite, or at lease amuse, the scientific community. Time to get back to work! In what is my 2nd bi-weekly installment of slagging Jack Layton for spamming his NDP membership (and NDP-watchers like me), I post the latest efforts of Wacky Jack to seek validation for his faltering party by pimping, er… rather *ahem* propelling his hero Thomas “Tommy” Douglas into top spot as Greatest Canadian. Who’s David Suzuki Voting The Greatest Canadian? David Suzuki’s voting for Tommy. You should too! Ok, I lied, the answer won’t surprise you. I’d vote for David Suzuki (a contender for the same contest), if for nothing else but his modesty before I’d vote for a man that will have Jack shamelessly gloating in the House while all of the other MPs roll their eyes before they continue to ignore Layton and sort out the nation’s business. Voting ends on Sunday, November 28 and the results will be announced on Monday, November 29 – That�s only over a week away – Tommy needs your vote now! Tommy Douglas is the “father of healthcare” (or so I’m led to believe) but should we be heralding a man for a system that’s not currently sustainable, a system which needs “a fix for a generation”, a “massive overhaul”? Layton ran on a promise of more money for healthcare instead of providing real solutions for keeping costs down and achieving sustainability. Forty cents of every tax dollar goes towards this massively inefficient system. Jack’s solution? Keep it at forty cents but collect more tax dollars. The solution of every other politician with at least a sense of economics? Get that cost down to achieve sustainability. Tommy? — If you want the respect for him as one of the greatest Canadians and thus a true statesman and ambassador of all things Canadian call the man Thomas! Johnny MacDonald? Petey Trudeau? Give Thomas Douglas at least some respect when it comes to his name! Terry Fox, of course, is the exception: we call him Terry because he was young and died after finishing his selfless act of running his Marathon of Hope for others who would be diagnosed with cancer long after his death. I call him Terry out of the greatest respect for a young man who is the greatest example of sacrifice and heroism in modern Canadian history. If a 60 year old man introduced himself to me as “Timmy” and told me invented the economy, I’d probably laugh. There are only three voting windows left to vote for Tommy as “The Greatest Canadian”. Window 3: Vote between Wednesday 9:00pm and Sunday Nov 28. You can vote at any time of the day. You do not have to vote while the show is on or directly after the show airs. You can vote five times on each phone line that you have access to (including your cell phone) in each of the three voting windows. So you can vote five times on your home phone, plus five times on your cell phone, plus five times on your work phone = 15 votes. Do this in each of the three voting windows and you’ll get 45 phone votes. If this is how Jack wants to handle electoral reform, I want no part of it. If Tommy Douglas wins this contest, he won’t be Greatest Canadian for all Canadians. Instead, he’ll be the Greatest Canadian among overly caffeinated NDPers, who’d vote for a man who created a healthcare system over a man who set out to run across the country on one leg to try and fund it. You can vote once in each voting window with each e-mail address that you have access to. You can vote once in each voting window by using text messaging for each cell phone that you have access to. Just put Tommy’s name in your message! The competition has heated up in the past two weeks. We can’t coast to the finish line. Every vote counts. Vote now and pass this onto your friends and encourage them to vote for Tommy as many times as permitted! If Jack had worked so hard during the election… well, he wouldn’t be Prime Minister, but maybe Olivia Chow would be one step closer to thinking SHE is. If I’ve added up the number of times that NDPers can vote for Tommy Douglas correctly, I get 70 (assuming work, home and spam email addresses). Ironically, if you apply this number votes to a forum in the real-world, say the House of Commons, the NDP would have (70 votes * 19 seats = 133 votes) which is one seat short of the Liberal Party’s ruling minority! (Carolyn Parrish got booted from the Liberal caucus today). which begs another question… why am I writing about Tommy Douglas? Today, along with Kingston residents, war veterans and fellow students, I attended the Remembrance Day service at the Cross of Sacrifice by the waterfront. The frigid cold wind and icy snow on this gray November day only served to remind us of the sadness of the ultimate sacrifice performed by the fallen sons and daughter of this nation, and the bitter practice of war waged to defend it. 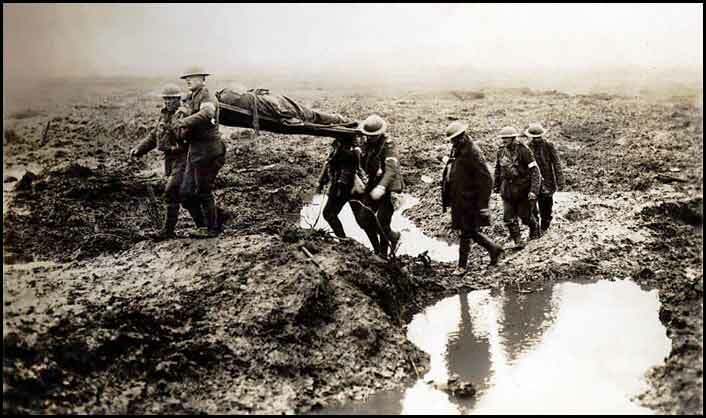 Remembrance Day, for me, is a time for solemn reflection on the sacrifice of veterans and those left behind, the appreciation I feel for never having to know war personally, and the bravery of those that serve today so that I may never come to know it. God bless our heroes past, present, and future. Today, as Canadians, we remember lest we forget. On the eve of the American election, a solid majority of Canadians are hoping for the defeat of the incumbent President George W. Bush in favour of the Democratic Senator from Massachusetts, John Kerry. However, our Liberal Prime Minister may be quietly hoping for the Republican status-quo on November 2nd. Paul Martin will achieve more in trade negotiations with Bush and as he does he will appear to have stood up to the Republican ‘cowboy’ President. Under Kerry, Canada’s already shaky position at trade talks will be tougher for Martin to manage. John Kerry has made it known that he plans to make bulk prescription drug purchases from Canada to lower American costs. Supply and demand dictates that Canadian drug costs will sky-rocket under the Kerry plan. Paul Martin’s “fix for a generation” and plans for pharmacare will be shelved for another generation as drug companies raise their prices to a point which is most profitable given the new demanding environment of the consumer that is the American federal government. Soon, the cost of drugs will reach a new equilibrium, between the two countries, as the markets merge giving the large American consumer a slight discount while dumping a large price-hike on the relatively small Canadian counterpart. On April 7th of this year, John Kerry signed a letter, along with Democratic Senators Ted Kennedy and Hillary Clinton, to Agriculture Secretary Ann Veneman to maintain the ban on Canadian beef. Canadian beef farmers are still suffering under this export ban which is based upon politics rather than science. John Edwards, John Kerry’s running mate, is a staunch protectionist that voted against NAFTA. While John Kerry voted for it, he wants it reviewed to protect the American worker. Canada should not also be so quick to embrace the democratic ticket because outsourcing of American jobs actually helps us. Nearly two thirds of outsourced American jobs go to Canada and Ireland, largely in the auto parts manufacturing and telemarketing industries. Southern Ontario and New Brunswick are particularly against the idea of Americans clamping down on outsourcing under John Kerry. The Democrat will actually weaken Paul Martin’s ability to favourably manage the Canadian economy. Granted, the American federal deficit has ballooned under George W. Bush, however, I don’t see how John Kerry can ameliorate the situation with his proposed $2.2 trillion of new spending. However much of that figure is spin, Kerry does plan to increase spending drastically. George W. Bush has made the American dollar weaker, while driving up our dollar in comparison, weakening our exports and trade deficit. However, the American economy isn’t about to get better under John Kerry’s watch, and as stated, neither is our export situation. The perceived unilateralism of the war in Iraq made a profound statement to Canadians regarding the new direction of American foreign policy, in particular its largely unpalatable policy of pre-emption. Yet, the Iraqi war is a red-herring, at least in Canadian domestic politics. Whether or not Americans went into Iraq had little bearing on the day-to-day functions of our lives, however, as Canadians who have largely lost their international influence and voice, we felt both helpless and frustrated due to our inability to influence or even interject. Let us also not forget that Paul Martin privately endorsed the war and that his first Minister of Defense, David Pratt, was also for the invasion of Iraq. Politically Paul Martin would prefer to keep our American cousins cautiously while appearing to achieve a coup in trade relations rather than achieve nothing with a Democrat President who speaks French, plays hockey and largely appeals to Canadians in their hearts but not their wallets. Would John Kerry be better for the world at large through his promise of multilateralism and broad alliances? Would John Kerry be better for the Canadian economy and Paul Martin’s domestic agenda? For those of us lucky enough to have the breadth of television programming that comes along with Canadian cable or satellite, a particular public service announcement from the Coalition Against Satellite Signal Theft may have flickered on our screens one or a hundred times. You may remember it: a boy steals a candy bar from a convenience store and when the boy’s father comes to discuss the situation with the boy and the authorities he asks “Where did you learn to steal?” and the boy replies “But dad, you steal satellite signals”. According to a ruling by Quebec judge Danielle Coté, that little boy’s father was not stealing at all, and was rather fighting his own victimization by the satellite companies for violating his rights to free expression gained through the importation of foreign television signals. The Satellite Coalition lamented that the case is not about expression but rather about programming rights. The problem is that the system is antiquated and constructed in a way that favours the comfort of companies in spite of the reality of the medium. If CTV is upset that Canadians will tune into the West Wing on NBC rather than their channel, perhaps CTV needs to figure out a way to keep Canadians interested. Furthermore, satellite signal interception is not a one-way street; Americans can capture the CTV signal and watch it instead of the Peacock. Simply, the law is one that comforts corporations at the expense of a consumer’s right to choice and a free market. Furthermore, it’s not all about Martin Sheen pretending to be President. News sources from around the world (with varying opinions) are occluded from Canadian consumption (and evaluation) merely because they may conflict with the values (read: position) of those that make television and media policy in this country. Today (October 20, 2004) is the 100th anniversary of the birth of Tommy Clement Douglas. He was born in Falkirk, Scotland. Tommy Douglas was Premier of Saskatchewan (1944-1961); the first federal leader of the New Democratic Party (1961-1971); and a Member of Parliament for the Cooperative Commonwealth Federation (1935-1944) and the New Democratic Party (1962-1968, and 1968-1979). This week, the CBC has started its contest to select “The Greatest Canadian” and Tommy Douglas has been nominated. The program and contest feature Douglas and nine other Canadians. Six weeks from now, one of them will be named “The Greatest Canadian.” The episode highlighting Tommy’s life, hosted by MuchMusic’s George Stroumboulopoulos aired on Monday, October 18th. It will be rebroadcast on CBC Newsworld at 7pm ET on October 23rd. The winner will be announced on Monday, November 29 at 8pm ET on the CBC. That’s all good and good but what can we do to pay hommage to the one known as Tommy? The CBC vote is a great opportunity for all New Democrats to mark the anniversary of the birth of Tommy Douglas. And to entrench social democratic values as the greatest “Canadian” values. It will also give Jack Layton something to talk about for about… forever. Everytime I get an email from the NDP, I get all teary eyed. This whole contest is turning into an exercise in media manipulation (we got Don Cherry nominated after all) for the purpose of political bonus points. If you must vote for somebody based upon a policy program, either vote for Tommy Douglas because of the idea for socialized healthcare, vote for Pierre Trudeau for the National Energy Program, or vote for John A. MacDonald for this wonderful idea and confederation we call Canada. Or please vote for Terry Fox, the most heroic Canadian example of excruciatingly painful altuistic sacrifice. If Terry Fox should win, it will be based upon his merit as the greatest Canadian that ever lived and he will accomplish this feat without any political party behind him shamelessly trying to score validation points. Did you know that you can vote for Tommy as “The Greatest Canadian” after each and every episode? That’s right. You can vote for Tommy more than once – but you can only do so after each episode. They’re not going to quit are they? The show airs every Monday and Wednesday, (except Nov 1 st) at 8 pm local time on the main CBC network. The results will be aired on Monday, November 29. One of the fundamental freedoms in any democratic society is the freedom of the press to report facts and uncover the truth wherever it may be. The press should investigate unhindered and express newsworthy information to public. With this principal democratic right comes the critically non-pervertible responsibility to report in an unbiased and truthful manner free of influence. Recently, however, the Conservatives are crying foul as a few journalists have been netted by the Liberal party to vocalize points of view rather than points of fact. The Globe and Mail’s Drew Fagan recently left his post as that paper’s Ottawa bureau chief to work for Foreign Affairs as a senior economic advisor. Most notable has been CBC Radio’s loss of Susan Murray who left to go spin for Scott Brison. The previous Liberal prime minister, Jean Chrétien appointed CTV reporter Jim Munson to the senate (Munson had worked for Chrétien for a mere 16 months before he got his golden ticket). Stephen Harper even joked about the situation at the annual Press Gallery Dinner when he expressed mock sympathy for journalists having to endure a 35 day interview period before being hired on by the Liberal government. Don Martin, columnist for the National Post, has suggested a cooling-off period for the government to hire journalists. He proposes a one year period after an election. Further, Martin writes, no national affairs journalists shall be entitled to receive the Order of Canada, a Senate appointment or a patronage assignment until they are no longer employed by the news media. Sounds like common sense. I don’t know if the following video is more cool or cruel (but I’m sure the cat got over it). It comes from the American Air Force Academy’s training on the KC-135A Reduced Gravity Research Program which flies an empty passenger jet (affectionately called the “Vomit Comet”) in a parabolic arc at the appropriate speed over the appropriate amount of time to simulate weightlessness within the Earth’s atmosphere. Researchers suspend a cat in the weightless environment while it tries to figure out which way is up. Homecoming weekend was a success. I met up with some old friends, introduced new grad school friends to some Queen’s traditions and met up with a few fellow bloggers. 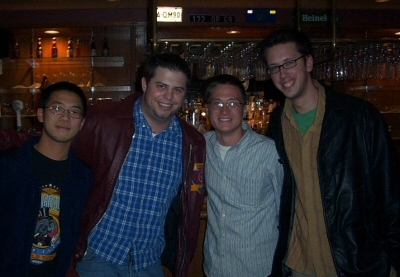 It turned out that Alfie’s was in fact closed and Clark Hall Pub was open (contrary to the homecoming weekend schedule posted in the Journal) so after the initial meet-up inside the JDUC, we decided to move the fun to the QP where beer and good times were had by all. Al McLeod of Gen X at 40 joined the fun for a short while before going out for a night on the town with his better half (hopefully he caught the latter half of the BoSox game). John Hamilton, Matt Fletcher and the elusive “Blackhole” from View From In Here and myself talked about everything from AMS politics to, well, federal politics to our blog war stories and l’affair Kinsella. The party then spilled out onto Aberdeen where we joined about 3000 Queen’s students, past and present, for the greatest Kingston block party of the year. I believe that the police presence didn’t dampen the party too much; however, it was the first year that I saw an alumnus (a 40 year old alumnus) in handcuffs and under arrest. I’m sure that even he would agree that the party was a mad success and that we’ll see everyone back on Aberdeen next year.